Malaysia is located in the equatorial region, and has a tropical rainforest climate. Located near the equator, Malaysia's climate is categorised as equatorial, being hot and humid throughout the year. The average rainfall is 250 centimetres (98 in) a year and the average temperature is 27 °C (80.6 °F). The climates of the Peninsula and the East differ, as the climate on the peninsula is directly affected by wind from the mainland, as opposed to the more maritime weather of the East. Malaysia is exposed to the El Niño effect, which reduces rainfall in the dry season. Climate change is likely to have a significant effect on Malaysia, increasing sea levels and rainfall, increasing flooding risks and leading to large droughts. Malaysia faces two monsoon winds seasons, the Southwest Monsoon from late May to September, and the Northeast Monsoon from October to March. The Northeast Monsoon brings in more rainfall compared to the Southwest Monsoon, originating in China and the north Pacific. The southwest monsoon originates from the deserts of Australia. March and October form transitions between the two monsoons. Local climates are affected by the presence of mountain ranges throughout Malaysia, and climate can be divided into that of the highlands, the lowlands, and coastal regions. The coasts have a sunny climate, with temperatures ranging between 23 and 32 °C (73.4 and 89.6 °F), and rainfall ranging from 10 to 30 centimetres (4 to 12 in) a month. The lowlands have a similar temperature, but follow a more distinctive rainfall pattern and show very high humidity levels. The highlands are cooler and wetter, and display a greater temperature variation. A large amount of cloud cover is present over the highlands, which have humidity levels that do not fall below 75%. The highest temperature was recorded at Chuping, Perlis on 9 April 1998 at 40.1 °C (104.2 °F). The lowest temperature (Official) was recorded at Cameron Highlands on 1 February 1978 at 7.8 °C (46.0 °F). The snowfall was recorded in a year was 1 cm (0.4 in) at Mount Kinabalu, Sabah in 1975 and 1993. The highest rainfall recorded in a day was 608 mm (23.9 in) in Kota Bharu, Kelantan on 6 January 1967. The highest rainfall recorded in a year was 5,687 mm (223.9 in) at Sandakan, Sabah in 2006. Meanwhile, the lowest rainfall recorded in a year was 1,151 mm (45.3 in) at Tawau, Sabah in 1997. The wettest place in Malaysia is Kuching, Sarawak with an average rainfall of 4,159 mm (163.7 in) with 279 days of rain a year. The driest place in Malaysia is in Sitiawan, Perak with average rainfall of only 1,787 mm (70.4 in) a year. Malaysia is located on the Sunda shelf, and is tectonically inactive. The oldest rocks in the country date from 540 million years ago, and are mostly sedimentary. The most common form of rock is limestone, formed during the Paleozoic Era. Limestone laid down in East Malaysia during the Tertiary period has since eroded, and such erosion forms basins of sedimentary rocks rich in oil and natural gas. The mountain ranges in Malaysia were formed through orogenesis beginning in the Mesozoic era. The total land area of Malaysia is 329,847 square kilometres (127,350 sq mi), the 66th largest country in the world in terms of area. It is the only country to contain land on both mainland Asia and the Malay archipelago. Peninsular Malaysia makes up 132,090 square kilometres (51,000 sq mi), or almost 40% of the country's land area, while East Malaysia covers 198,847 square kilometres (76,780 sq mi), or 60%. From the total land area, 1,200 square kilometres (460 sq mi) or 0.37% is made up of water such as lakes, rivers, or other internal waters. Malaysia has a total coastline of 4,675 kilometres (2,905 mi), and Peninsular Malaysia has 2,068 kilometres (1,285 mi), while East Malaysia has 2,607 kilometres (1,620 mi) of coastline. Malaysia has the 29th longest coastline in the world. The two distinct parts of Malaysia, separated from each other by the South China Sea, share a largely similar landscape in that both West (Peninsular) and East Malaysia feature coastal plains rising to hills and mountains. The topography of Malaysian Borneo. Peninsular Malaysia covers the southern half of the Malay Peninsula, and extends 740 kilometres (460 mi) from north to south, and its maximum width is 322 kilometres (200 mi). It is mountainous, with more than half of it over 150 metres (492 ft) above sea level. About half of Peninsular Malaysia is covered by granite and other igneous rocks, a third more is covered by stratified rocks older than the granite, and the remainder is covered by alluvium. Harbours are only available on the peninsula's western side, and the most fertile land occurs when river valleys flow out to the sea. The coastal plains bordering the straits of Malacca are the most densely populated areas of Malaysia, and contains Malaysia's capital, Kuala Lumpur. East Malaysia, on the island of Borneo, has a coastline of 2,607 kilometres (1,620 mi). It is divided between coastal regions, hills and valleys, and a mountainous interior. There are only two major cities, Kuching and Kota Kinabalu. Much of southern Sarawak is coastal lowlands, which shifts to a series of plateaus going north, ending in the mountainous regions of Sabah. Mount Kinabalu, the highest point of Malaysia, is located in Sabah. The highest mountain range in Malaysia is the Crocker Range in Sabah, which divides the state in half. This range includes Mount Kinabalu, the highest mountain in the country, as well as Mount Tambuyukon, the third highest in the country. Mount Kinabalu, at 4,095.2 metres (13,436 ft), is the tallest mountain in Malaysia and is protected as Kinabalu National Park, a UNESCO World Heritage Site. Mountain ranges in the East tend to follow north-south or northeast-southwest paths, and the highest ranges form the border between Malaysia and Indonesia. The mountains contain many jagged limestone peaks. The Trus Madi Range, also in Sabah, houses Mount Trus Madi, the second highest peak in Malaysia. Bombalai Hill in Sabah is the only active volcano in Malaysia. Peninsular Malaysia contains numerous mountain ranges running parallel from north to south along the peninsula. The main mountain range is the Titiwangsa Mountains, which divides the peninsula between its east and west coasts. It houses Mount Korbu, the second highest peak in the Peninsular. These mountains are heavily forested, and mainly composed of granite. The range is the origin of some of Peninsular Malaysia's river systems. To the east of this range is the Bintang Range. The highest peak in the Peninsular is Mount Tahan, located on the Tahan Range. Bantang River Recreational Forest in Segamat District, Johor. Malaysian forests can be categorised as tropical rainforest. Approximately 58.2% of Malaysian land is covered by forest. A large amount of lowland forest present below an altitude of 760 metres (2,493 ft). East Malaysia, like most of Borneo, was formerly covered with Borneo lowland rain forests with over 2000 tree species. However, much of it has been cleared, due to the increase in logging since the 1960s and the increase of shifting cultivation. Over 80% of Sarawak's forests have been felled, and the logging throughout East Malaysia has polluted waterways, increased erosion, and damaged agriculture. Some state governments have now taken measures to halt the degradation of the rainforest. Malaysia's rainforest's are made of a variety of types, mainly dipterocarp, swamps, and mangroves. The majority of the forest is dipterocarp forests. Dipterocarps species are centred in Malaysia. There are over 1,425 square kilometres (550 sq mi) of mangroves in Malaysia. Some areas are designated as forest reserves, state parks, or national parks. The management of these reserves as under control of the Department of Wildlife and National Park, the Forest Department of Sarawak, the Sabah Forestry Department, Sabah Foundation, and Sabah Parks. As of 2000, there are two World Heritage Sites under the natural category – Kinabalu National Park and Gunung Mulu National Park. Numerous caves run through the country due to the karst landscape caused by water eroding limestone. The Mulu Caves in East Malaysia are the largest caves in the world. They are located between the Penambo range and Brunei, and form a major tourist attraction. At 700 metres (2,297 ft) long and 70 metres (230 ft) high the Sarawak Chamber is the largest cave chamber in the world. Other famous caves are the 1.6 kilometres (1 mi) Deer Cave and Lang's Cave. A beach on Redang Island in the South China Sea. Malaysia contains numerous islands, the largest of which is Banggi Island in Sabah, which has an area of 440.7 square kilometres (170 sq mi). It is followed by Betruit Island in Sarawak, Langkawi in Kedah, and Penang Island in Penang. The largest island shared with another country is Borneo, followed by Sebatik Island. In addition, Malaysia lies within the world's coral reef distribution. The reefs can be usually found around islands such as Sipadan Island, Swallow Reef, and Redang Island. Sipadan Island, an underwater mountain, is Malaysia's only oceanic island. The southernmost point of Malaysia is located in the district of Serian in Sarawak. Tanjung Piai on the southern tip of Johor is the southernmost point in Peninsular, and thus of the whole of continental Eurasia. The easternmost point is found on the tip of Dent Peninsular in Lahad Datu district in Sabah. The northernmost point is found on the northern tip of Banggi Island. The westernmost point is Perak Island, a sandstone rock which is part of Kedah state that rises at the center of Strait of Malacca. The 1056m Johor-Singapore Causeway connects Malaysia and Singapore across the Straits of Johor. In the background is Johor Bahru. Between Peninsular Malaysia and East Malaysia is the South China Sea, the largest body of water around Malaysia. Facing the western coast of Peninsular Malaysia there is the Straits of Malacca towards the south, and the Andaman Sea towards the north. The Strait of Malacca, lying between Sumatra and Peninsular Malaysia, is arguably the most important shipping lane in the world. These seas are marginal seas of the Indian Ocean. Off the east coast of Peninsular Malaysia is the South China Sea, while a small part in the north lies within the Gulf of Thailand. These form part of the marginal seas of the Pacific Ocean. The Straits of Johor off the south of Peninsular acts as a maritime border of Malaysia and Singapore. In East Malaysia, the western coasts of Sabah and Sarawak faces the South China Sea. The northeast coast of Sabah faces the Sulu Sea, while the southeast coast of Sabah faces the Celebes Sea. Malaysia claims 12 nm (22 kilometres (14 mi)) as its territorial waters, which extend into the Coral Triangle. It also claims 200 nm (370 kilometres (230 mi)) of exclusive economic zone. In addition, Malaysia claims 200 metres (656 ft) in the depth of the continental shelf or to the depth of exploration in within the area below the South China Sea known as Sundaland. The territorial claim for the Straits of Malacca is shared between Malaysia and Indonesia in accordance to a treaty signed in 1970 known as the Treaty Between the Republic of Indonesia and Malaysia on Determination of boundary Lines of Territorial Waters of the two Nations at the Strait of Malacca. The Bera Lake in Pahang is one of the largest lakes in Malaysia, and one of the only two natural lakes in Malaysia with Chini Lake. Pedu Lake is a 12 kilometres (7 mi) long lake located 5 kilometres (3 mi) from the Malaysian-Thai border and Kenyir Lake is the largest artificial lake in Southeast Asia. There are many systems of rivers found around Malaysia. The longest is the Rajang River in Sarawak with a length of 760 kilometres (472 mi). The second longest is the Kinabatangan River in Sabah with a length of 560 kilometres (348 mi). The longest river in the Peninsular Malaysia is Pahang River with a length of 435 kilometres (270 mi). Malaysia is a megadiverse country, with a high number of species and high levels of endemism. These forests contain the Rafflesia, the largest flower in the world. The clearing of the Borneo lowland rain forests has caused wildlife to retreat into the upland rain forests inland. Malaysia's geographical location protects the country from most major natural disasters. It is located on a seismically stable plate that minimises direct risks of earthquakes and volcanoes, is partially protected from tsunamis by surrounding landmasses, and is a rare target for tropical cyclones. However, the country's tropical climate opens the country to the risk of flooding, landslides and prolonged droughts. Peninsular Malaysia Precipitation Map on December 2004 showing heavy precipitation on the east coast, causing floods there. With 189 water basins and an average rainfall of over 2000-4000 mm per year, Malaysia is prone to riverine, muddy floods that range from hours-long flash floods, to prolonged flooding on flat, low-lying land along major tributaries and main stems. There have been 15 instances of major flooding in Malaysia since 1926. Flooding has been a major concern in recent decades due to rapid development in river catchment areas that has led to increased surface and river runoffs, increased sediment buildup in rivers, and a higher risk of overflowing rivers. The 2006 and 2007 floods in Johor has resulted in loss of RM1.5 billion and 18 lives in addition to the temporary displacement of 110,000 people. Due to weak Coriolis forces from its close proximity to the equator, tropical cyclones are extremely rare for the country despite its proximity to the highly active Northwestern Pacific tropical cyclone basin; the only tropical cyclone to significantly affect Malaysia since records began was Tropical Storm Vamei in 2001. Malaysia is largely seismically stable with little modern history of volcanic activity, being situated entirely on the Sunda tectonic plate, between two major boundaries of the Australian Plate and Eurasian Plate in the west of Peninsular Malaysia, and the Philippine Sea Plate and Eurasian Plate at Bornean Malaysia. While Peninsular Malaysia is more accustomed to only light tremors caused by earthquakes along the Sumatran islands of Indonesia generated predominantly by the Great Sumatran fault and Sunda megathrust, the Borneon states, particularly Sabah, is at risk of more moderate interplate and intraplate earthquakes due to its closer proximity to active tectonic activities along the Ring of Fire, with record earthquakes in the country occurring in the state in 1976 and 2015 at an average of 6.0 Mw. As is with Singapore, the effects of tremors are also felt more significantly on skyscrapers common in populated centres in Malaysia due to the effects of mechanical resonance. Bombalai Hill, the only known volcano in the country, is also situated on the eastern edge of Sabah and last erupted approximately 10,000 years ago. Interest towards tsunami risks to Malaysia has also heighten since the 2004 Indian Ocean earthquake. Although the western coast of Peninsular Malaysia was largely shielded by the Sumatran island from the full effects of waves generated by the earthquake, weaker deflected tsunami waves led to damage and casualties along the northwestern coast of Peninsular Malaysia, affecting coastal Perlis, Kedah, Penang and Perak. The disaster also highlights the risk of further tsunamis that may strike coasts in direct line of undersea faults, primarily around the South China Sea. Malaysia was the largest exporter of tin until the industry wide collapse in 1980s. Tin deposit are found in Selangor, Kinta valley in Perak, Pahang and Johor. There are significant deposit of gold in Pahang towns of Raub and Kuala Lipis and also Kelantan's district of Gua Musang. Coal is mostly concentrated in Sarawak town of Kapit, Mukah and Silantek. Timber can be found in the vast jungles in Malaysia, especially in East Malaysia. Malaysia total exports for timber and other timber products amounted to MYR 23.4 billion in 2007. Large areas of land are used as palm oil plantations, rubber plantations, and paddy fields. Malaysia is the largest exporter of palm oil in the world producing 15.8 million tonnes of crude palm oil in 2007. Malaysia is also one of the largest producers and exporters of rubber and other rubber products. As of 2011, the percentage arable land in Malaysia is 5.44%. Croplands consists of 17.49% while other land uses consists of 77.07%. As of 2009, irrigated land covers 3,800 km². Total renewable water resource total 580 cubic km as of 2011. Peninsular Malaysia is more populated than East Malaysia where 79.2% of the population lives in the Peninsular. In 2002, 59% of Malaysian population lived in urban areas, while the rest live in rural areas. The largest city is Kuala Lumpur with a population of 1.89 million people in the city, and about 7 million in the metropolitan area known as Klang Valley. Other major cities include George Town, Ipoh, Johor Bahru, Kuching, and Kota Kinabalu. A Map of Malaysia's states. Malaysia is divided into thirteen states and three Federal Territories. Eleven states and two Federal Territories are found in Peninsular Malaysia. While two states and one Federal Territory are found in East Malaysia. The states are further divided into administrative districts. In Sabah and Sarawak, they are first divided into divisions, then further divided into districts. There are separate subdivisions for electoral districts for polling purposes. International borders between Malaysia and Indonesia, Thailand, Singapore and Brunei are defined mostly by geological features such as the Perlis River and Golok River between Malaysia and Thailand; Straits of Johor between Malaysia and Singapore; and Pagalayan Canal between Malaysia and Brunei. However, borders that extends to the seas are defined by agreements such as Straits Settlement and Johore Territorial Waters Agreement of 1927 which defines Malaysia and Singapore water borders. Malaysia's land borders are well established. The border with Thailand was established in 1909 when Siam ceded Kedah, Kelantan, Perlis and Terengganu to the British. Maritime border disputes between Brunei and Malaysia and a Bruneian claim on Limbang, Sarawak were resolved in an exchange of letters between the two countries on 16 March 2009 after 20 years of negotiations. Malaysia and Indonesia have some overlapping maritime claims, notably in the area around Sabah. An ongoing series of meetings to resolve these claims has produced 16 border agreements (to September 2010). Malaysia and Singapore also have disputes concerning some maritime borders. The Philippines has a dormant claim to the eastern part of the Malaysian state of Sabah. Malaysia is also involved in a dispute involving Vietnam, Brunei, the People's Republic of China, the Philippines, and the Republic of China (Taiwan), concerning the Spratly Islands in the South China Sea. ^ a b c d e f g h Saw Swee Hock (2007). The Population of Peninsular Malaysia. Institute of Southeast Asian Studies. ISBN 978-981-230-427-8. ^ "Malays Travel Guide:Climate of Malaysia". Circle of Asia. Retrieved 28 July 2008. ^ a b c d e f g h i j k l m n o p World and Its Peoples: Eastern and Southern Asia. Marshall Cavendish. 2007. ISBN 978-0-7614-7642-9. ^ "Weather phenomena". Malaysian Meteorological Department. Archived from the original on 20 March 2008. Retrieved 31 July 2008. ^ a b "General Climate Information". ^ a b c d e f g CIA. The World Fact Book: Malaysia. Retrieved 4 April 2019. ^ Encyclopædia Britannica. The Land (West Malaysia). ^ Simon Richmond (2010). Malaysia, Singapore & Brunei. Lonely Planet. ISBN 978-1-74104-887-2. ^ "Mount Kinabalu – revered abode of the dead". Ecologyasia.com. Retrieved 17 September 2010. ^ Alan M. Stevens (2004). A comprehensive Indonesian-English Dictionary. PT Mizan Publika. ISBN 978-979-433-387-7. ^ "Main Range (mountains, Malaysia)". Encyclopædia Britannica. Retrieved 1 October 2010. ^ a b c d e f "The Malaysian Rainforest". Wwf.org.my. Retrieved 1 October 2010. ^ Mohd Huzaifah Muntalip (16 May 2011). "Top 5 Largest Islands in Malaysia". Akademi Fantasia Travel. Retrieved 2 September 2016. ^ "Coral reef image". NASA. Archived from the original on 5 August 2008. Retrieved 31 July 2008. ^ "Go: A diver's paradise". New Straits Times. 1 December 2010. Archived from the original on 22 June 2011. Retrieved 15 December 2010. ^ "Asia's southernmost tip". Travel Times. 3 July 2007. Archived from the original on 3 July 2007. Retrieved 26 October 2010. ^ Sager Ahmad (22 August 2003). "Tanjung Piai, The End of Asia". Travel Times. Archived from the original on 22 August 2003. Retrieved 26 October 2010. ^ Andrew Marshall (31 July 2006). "Waterway To the World - Summer Journey". Time. Retrieved 28 October 2010. 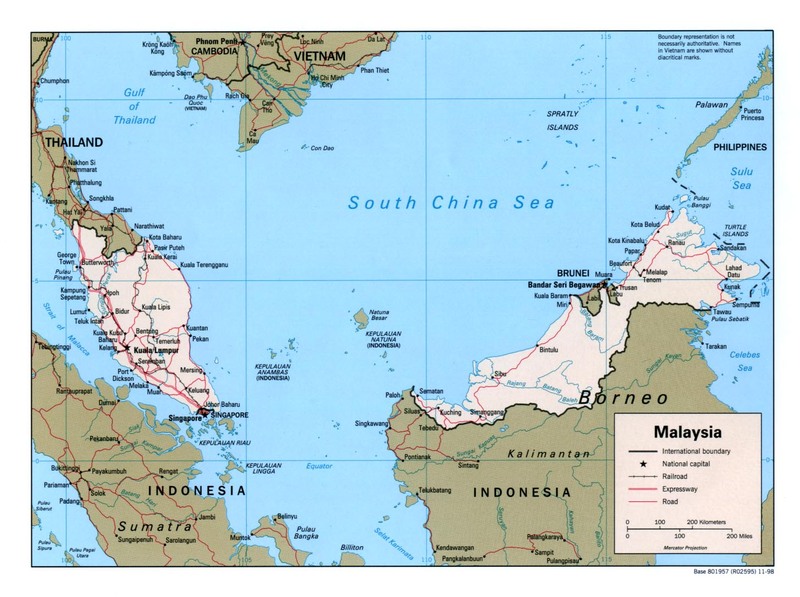 ^ "Malaysia Maritime claims - Geography". www.indexmundi.com. Retrieved 29 January 2018. ^ "WWF – Coral Triangle". Wwf.panda.org. Retrieved 14 September 2010. ^ "Maritime Claims". CIA The World Factbook. Retrieved 31 July 2008. ^ "Indonesia-Malaysia Territorial Sea Boundary" (PDF). The Geographer, Department of State, USA. Retrieved 31 July 2008. ^ "Biodiversity Theme Report". Australian Government Department of the Environment, Water, Heritage and the Arts. 2001. Archived from the original on 14 May 2007. Retrieved 24 January 2009. ^ "Flood and Drought Management in Malaysia". Ministry of Natural Resources and Environment Malaysia. 21 June 2007. Archived from the original on 10 September 2008. Retrieved 1 August 2008. ^ "Keseismikan Malaysia" (in Malay). Meteorological Department of Malaysia. Archived from the original on 24 June 2008. Retrieved 30 July 2008. ^ "Recent Earthquake Near Sabah, Malaysia". earthquaketrack.com. Retrieved 16 July 2015. ^ Dr Salleh Buang (26 April 2006). "Dealing with a restless planet". New Straits Times. Archived from the original on 22 August 2006. Retrieved 31 July 2008. ^ a b "Malaysia export growth slows to 16.9%". International Herald Tribune. 4 January 2005. Retrieved 30 July 2008. ^ "Tin Mine Operators in Malaysia". Geoscience and Minerals Department of Malaysia. Archived from the original on 10 November 2008. Retrieved 4 August 2008. ^ "Gold Mine Operator in Malaysia". Minerals and Geoscience Department of Malaysia. ^ a b "Key Statistics of Malaysia". Department of Statistics Malaysia. Archived from the original on 23 March 2008. Retrieved 30 July 2008. ^ "Malaysia Chemical Reports 2008". Business Monitor International. Archived from the original on 29 April 2008. Retrieved 31 July 2008. ^ "Environment at a Glance 2004: Malaysia" (PDF). World Bank. Retrieved 31 July 2008. ^ "FACT Sheet Malaysia: Rural Women in the Malaysian Economy". Food and Agriculture Organization for the United Nations. Retrieved 30 July 2008. ^ "Border Issues Between Malaysia, Brunei Solved: Official". CRIENGLISH.com. Xinhua News Agency. Retrieved 6 September 2010. ^ "Indonesia, Malaysia to discuss border issues in September". Xinhua News Agency. Retrieved 6 September 2010. ^ "Malaysia, Indonesia ministers meet to soothe tensions". Channel NewsAsia. Retrieved 6 September 2010. Wikimedia Commons has media related to Geology of Malaysia. This page was last edited on 19 April 2019, at 23:18 (UTC).